VREDEMAN DE VRIES -Perspective print by Vredeman de Vries. VREDEMAN DE VRIES, J./ HONDIUS, H. - Perspective print by Vredeman de Vries. 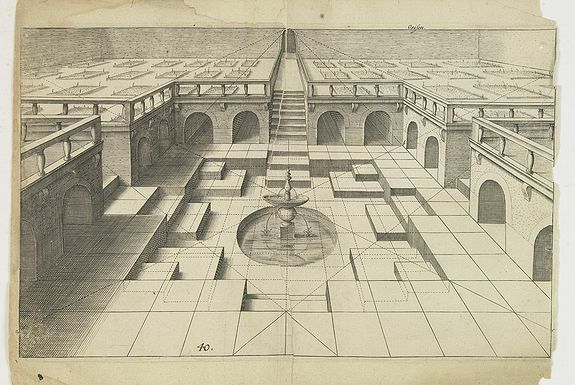 Perspective print by Vredeman de Vries. - VREDEMAN DE VRIES, J./ HONDIUS, H.
Title : Perspective print by Vredeman de Vries..
Map maker : VREDEMAN DE VRIES, J./ HONDIUS, H.. Date : The Hague, 1605. Size : 7.2 x 11.6 inches. / 18.4 x 29.5 cm. Description :Engraving from Perspective, Dat is, de hooch-gheroemde conste eens schijnende in oft door-siende ooghen-ghesichtespunt ... (&c.) by Hans, or Johannes Vredeman de Vries (ca.1527-1604), a famous Dutch architect and draughtsman, known in the Low Countries as 'The king of architects'. Condition : Good impression. Paper slightly age-toned, and some marginal. Old repair of vertical tear. Right hand margin cut till neat line.